Watch the Queen Mary's transformation begin. 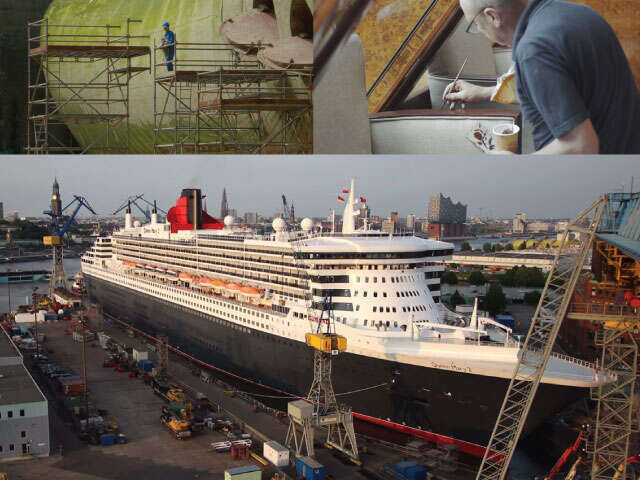 Over 2,600 contractors and 1,200 crew have been working tirelessly to transform Queen Mary 2. Queen Mary 2 arrived in Hamburg on 28 May to undergo a remastering of unparalleled scale. Maneuvering into the Elbe 17 Dry Dock was no mean feat – there were inches to spare. It’s only when the dry dock is emptied that the full scale of our flagship becomes clear. Over 2,600 contractors and 1,200 crew have been working tirelessly to transform Queen Mary 2. All the while, White Star Service remains with our galleys catering for the contractors on board. Click here to view more pictures and videos.